Ultra-Clear is a new and exciting Optical Quality Tempered Glass with Exceptional Clarity and High Light Transmission, with No Color Distortion. The Exceptionally High Light Transmittance and Lack of Distortion in the Ultra-Clear Lens Maximizes the Light available for Improved Visual Acuity, especially Underwater in Low Light Conditions, Better Vision, Truer Colors is what you get with Atomic Aquatics Ultra-Clear Lenses. 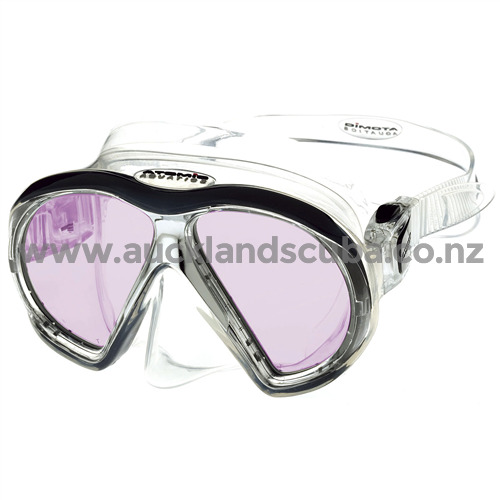 If you need to use Corrective Lenses the Atomic Aquatics Sub-Frame Mask has Optional Corrective Lenses available (see SKU: ATMMLSFL10). In addition the Sub-Frame Mask ARC has an Anti-Reflective Coating which allows more light to enter the mask and reduce light reflection. This makes seeing through the mask better above and below the water. Atomic Aquatics developed ARC (Anti-Reflective Coating) Technology to Reduce Reflected Light and actually Increase the amount of Available Light Transmitted to a Diver's Eyes. The result is a greatly Improved Transmission of 98% of Available Light, compared to a loss of more than 14% of light with standard green "float" glass used on the majority of masks on the market. Anti-Reflective Coatings or ARC" is a Multi-Layer Metal Oxide Coating Process applied to both sides of the Ultra-Clear Lenses. This allows more light to enter the mask by Reducing Light Reflections off the inside and outside surface of the lens. The Metal Oxide Coating is only a few Microns Thick.ARC will give you Clearer, Crisper Vision. You will see more Clearly Underwater and Objects in the Distance will become more Defined and Acute. ARC also Increases Contrast and Clarity, Reduces Eyestrain, Glare, and prevents Ghost Images on the Viewing Area of the Lens. ARC is an Absolute Must for Night Diving, Limited Visibility Conditions, and Underwater Photographers. In addition the Sub-Frame Mask ARC has an Anti-Reflective Coating which allows more light to enter the mask and reduce light reflection. This makes seeing through the mask better above and below the water. Atomic Aquatics developed ARC (Anti-Reflective Coating) Technology to Reduce Reflected Light and actually Increase the amount of Available Light Transmitted to a Diver's Eyes. The result is a greatly Improved Transmission of 98% of Available Light, compared to a loss of more than 14% of light with standard green "float" glass used on the majority of masks on the market. Anti-Reflective Coatings or ARC" is a Multi-Layer Metal Oxide Coating Process applied to both sides of the Ultra-Clear Lenses. This allows more light to enter the mask by Reducing Light Reflections off the inside and outside surface of the lens. The Metal Oxide Coating is only a few Microns Thick. ARC will give you Clearer, Crisper Vision. You will see more Clearly Underwater and Objects in the Distance will become more Defined and Acute. ARC also Increases Contrast and Clarity, Reduces Eyestrain, Glare, and prevents Ghost Images on the Viewing Area of the Lens. ARC is an Absolute Must for Night Diving, Limited Visibility Conditions, and Underwater Photographers. The Atomic Aquatics Sub-Frame Mask has a Double Feathered Edge Skirt that provides an Excellent Seal on the Divers Face with an Easy-to-Reach One-Handed Nose Well for Ear Equalization. The Wide Split Style Mask Strap Increases the Masks ability to conform to your Face adding to its great Sealing Ability. The Mask is available in 2 color choices of All Black or Clear. The Atomic Sub-Frame Mask is so durable it carries a Limited Lifetime Warranty against Frame Breakage! Mask also comes with a Mask Box. 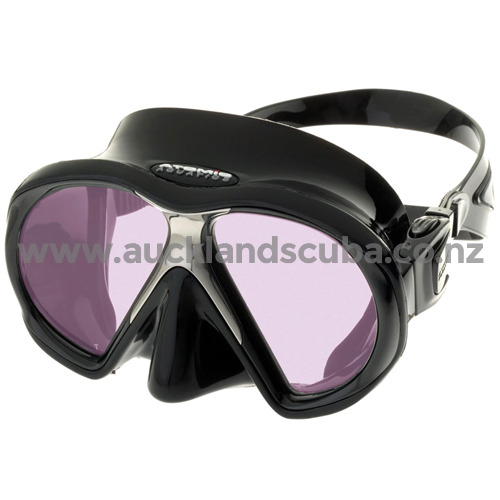 The Atomic Sub-Frame Anti-Reflective Coating Mask is commonly used for Open Water Diving and more. The Atomic Sub-Frame Anti-Reflective Coating Mask is popular because customers like the following qualities of the Atomic Sub-Frame Anti-Reflective Coating Mask: Lens Quality, Range of Vision, Snug Fit.